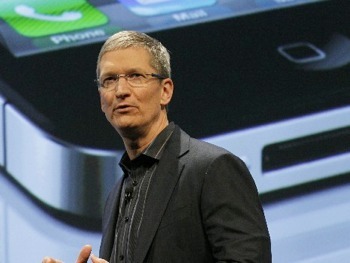 Apple chief Tim Cook has elected to forego a $75 million payout in restricted stock dividends owed to him. The company announced plans late last week that would pay a $2.65 per share dividend on restricted stocks held by Apple employees. It’s rare for a company to reward employee stockholders in this fashion and even more uncommon for a high level executive to walk away from money they are entitled to. All Things D points out that the decision to turn down the money could actually benefit the company and his wallet in the long run. The move will no doubt shine a positive light on Apple and Cook which could ultimately translate to more stocks sold. It also goes a long way to showcase the kind of person that Cook is amidst the perception that all executives are greedy and have a sense of entitlement. After all, it’s not as if the CEO is hurting for money. Cook reportedly earned $58 million in 2010 with a base salary of $800,000, a $5 million bonus and $52 million in stock for fulfilling CEO duties while Steve Jobs was away due to health reasons in 2009. Apple offered him 1 million restricted shares of company stock in August 2011 in order to retain his services through 2021. The shares were split into two 500,000 bundles that vest in 2016 and 2021. Based on current stock prices, this equates to $562 million but with some analysts expecting Apple shares to surpass $1,000 in the not-so-distant future, he stands to earn quite a bit more in the coming years.